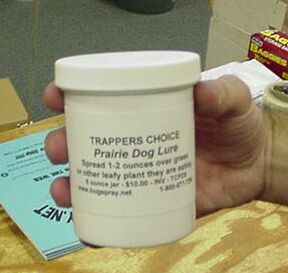 PRODUCT DESCRIPTION: Trappers Choice Prairie Dog Lure is great to use in any live or kill type trap. 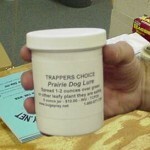 It's a blend of several grasses and plants which smell strong and will get the attention of any foraging dog. Add a teaspoon directly to the trip pan of any live trap we have featured in our PRAIRIE DOG article and then a tablespoon on top of the grass bait added behind the trip pan. RATE OF APPLICATION: 1 teaspoon the trip pan and 1 tablespoon behind it per set per trap. Since dogs are so curious they will generally find their way into the trap quickly.